RON SHANDLER began publishing his unique brand of statistical information under the Shandler Enterprises name in 1986. A fantasy leaguer since 1985 and a simulation gamer since 1971, Ron was the first author to develop sabermetric applications for fantasy league play. He is the author of the Baseball Forecaster annual, now celebrating its 33rd year of publication; he is the founder of the industry trail-blazing web site, BaseballHQ.com and the First Pitch Forums nationwide conference series. Ron also helped spearhead the creation of the Tout Wars national experts competition, which was the focus of the “Fantasyland” book and documentary film. Ron’s work has appeared in numerous publications and web sites. He has written for USA Today, ESPN.com and ESPN The Magazine. He has been cited by many sources, including The New York Times, Wall Street Journal, Forbes, Business Week and Money magazine. Many Major League teams are regular customers of his books and web services. Pure Quality Starts: A measure of a starting pitcher’s effectiveness based on component skills. Reliability Grade: A measure of a player’s risk, based on health, experience and performance consistency. Portfolio3 Plan: An integrated strategy in which players are evaluated based on skill and risk, and slotted into a three-tiered draft portfolio. Mayberry Method: A player evaluation method that embraces the imprecision of the forecasting process by projecting elements of performance using a simple 0-5 scale. Broad Assessment Balance Sheet (BABS): A roster construction strategy that evaluates players using broad measures and sets targets as a balance between assets and liabilities. Ron has an MBA from Hofstra University, is a professional direct marketer and forecasting analyst by trade, and held senior management positions with several international publishers prior to starting Shandler Enterprises. A native New Yorker and die-hard Mets fan, he is married with three daughters and currently lives in Port St. Lucie, FL. Joined first Rotisserie league (Hockey Association of the Granite State). Following spring created the Baseball Association of the Granite State, which would run for 10 years. Joined the Society for American Baseball Research (SABR). 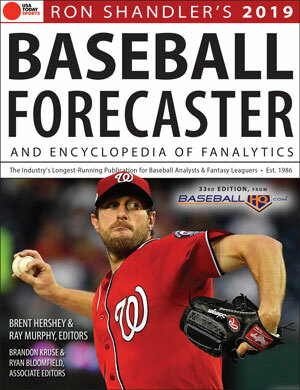 Published Baseball SuperSTATS book; renamed Baseball Forecaster in 1988. Launched the “Sports Forecaster” newsletter; renamed “Baseball Forecaster” newsletter in 1992. “Rotisserie Baseball and the New Statistics” article published in SABR’s Baseball Research Journal. Invited to participate in LABR, the industry’s first national experts competition. Spent the entire summer in first place, but dropped to third as the players went on strike. Took over Arizona Fall League fantasy baseball conference from Fantasy Sports Journal. Renamed First Pitch Arizona. Shandler Enterprises Co. was reformed as Shandler Enterprises, LLC. Finished in 3rd place, LABR-NL. Spearheaded the founding of Tout Wars, the industry’s second national experts competition. Won both AL and NL Tout Wars competitions. Discontinued publishing the “Baseball Forecaster” newsletter. Finished in 2nd place, Tout Wars-AL. Finished in 1st place tie, Fantasy Sports Trade Association (FSTA) Experts League. BaseballHQ.com won the Fantasy Sports Trade Association‘s (FSTA) “Best Fantasy Baseball Online Content” award. Launched RotoHQ.com, a site dedicated to fantasy/Rotisserie baseball strategy. Baseball HQ data was used to demonstrate a fantasy baseball model in the college textbook, “Business Forecasting” by John E. Hanke, 7th Edition. Launched First Pitch Forums local conferences. Launched the XFL (fantasyxperts.com), the industry’s only national experts keeper league. BaseballHQ.com won the FSTA’s “Best Fantasy Baseball Online Content” award. Helped create and participate in an advisory board for the St. Louis Cardinals baseball club. Created Tout Wars, LLC and became part of the management group. Received the FSTA’s Lifetime Achievement Award, one of only four people in the industry to receive the honor at the time. Began publishing the Minor League Baseball Analyst annual book. Began publishing the Graphical Pitcher (by John Burnson), which became the Graphical Player in 2007 (through 2008). Featured in the book Fantasyland by Sam Walker. Regular columnist for ESPN The Magazine and ESPN.com. Was one of 12 industry analysts who each contributed a chapter to the book, How Bill James Changed Our View of Baseball. Published the second edition of How to Value Players for Rotisserie Baseball (by Art McGee). Published the Baseball Injury Report (by Rick Wilton). Sold Shandler Enterprises, LLC to Fantasy Sports Ventures. Created The Shandler Company, LLC. “Fanalytics” column began running weekly during the baseball season in USA TODAY (through 2014). “Shandler” appears as an entry in “The Dickson Baseball Dictionary” 3rd Edition. Began a periodic blog in the Huffington Post. Finished in 3rd place, Tout Wars-AL. Appeared in the 2010 ESPN documentary, “Silly Little Game,” part of the network’s “30-for-30” series. Featured in the documentary film “Fantasyland”, based on the book. First Pitch Arizona won FSTA’s “Best Live Fantasy Event” award. Won the FSTA Experts League. Inducted into the Fantasy Sports Writers Association (FSWA) Hall of Fame. Fantasy Sports Ventures sold to Gannett, Inc.’s USA Today Sports Media Group. Named to the FSWA Board of Directors. Wrote the Introduction to Winning Fantasy Baseball by Larry Schechter. Stepped down from running the operations of BaseballHQ.com. Launched ShandlerPark.com to run monthly fantasy leagues (through 2015). Celebrated the 20th anniversary of First Pitch Arizona. Stepped down from contributing to BaseballHQ.com. Restarted regular contributions to ESPN.com (through 2018). Baseball Forecaster won the FSWA’s “Best Fantasy Baseball Publication” award. Celebrated the 30th Anniversary edition of the Baseball Forecaster. Re-launched RonShandler.com as a content site. Published Ron Shandler’s Other Book. Celebrated the 20th anniversary of BaseballHQ.com. 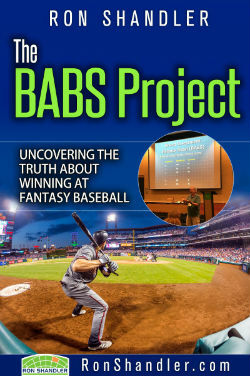 Published The BABS Project: Uncovering the Truth About Winning at Fantasy Baseball. BaseballHQ.com won the FSTA’s “Best News & Analysis Site, Single Sport” award. Baseball Forecaster won the FSTA’s “Best Print Publication” award. Joined TheAthletic.com as a weekly columnist. over the past 3-plus decades. About the logo… The green grid is a dual image. It represents both a stadium seating chart as well as an outfield defensive configuration. The orange cell is the section where you’ll be sitting… or the spot where Mike Trout’s latest hit just landed. In a more holistic sense, the orange cell is also a reminder that, in a sea of possibilities, everything we experience is just a single data point. Sample size is everything.